But he was blessed—saved from the shanties and squalid tenements of segregated Savannah by his grandparents, who were amazingly strong, disciplined, independent, and self-sufficient people. His grandfather Myers Anderson demanded uncompromising habits of self-discipline, hard work, and accountability. “Blisters come before calluses, vulnerability before maturity”: That’s how the Justice later summed up the life lesson he learned from his grandfather. Myers Anderson sent young Clarence to be educated by the strict nuns of St. Benedict the Moor Grammar School. In a world-historic act of grace, the Franciscan nuns of St. Benedic t’s impressed upon the future Associate Justice the faith that all human beings, without exception, have inherent dignity, are entitled to respect, and are equal—truly equal—in the eyes of God. As it turns out, and as President George H.W. Bush accurately sensed in 1991, the impressions left by the nuns and the unbelievable totality of the life path of Clarence Thomas make him ideally suited to serve his nation as a Justice in the inner sanctum of the Supreme Court Building—a building whose West Pediment bears the most apt inscription Equal Justice Under Law. In October 1991, Justice Thomas emerged from the blast furnace of his confirmation hearings purified in his soul and case-hardened in his natural judicial sensibilities and intellect. He was sustained by the love and admiration of his wife Ginni and his many close friends and colleagues. 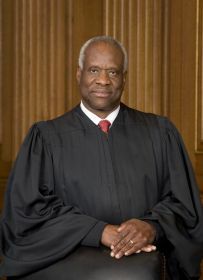 But, predictably, after the searing and hyper-politicized spectacle of the confirmation, and in reaction to the Justice’s clear and bold opinions, his relative reticence toward the media, and his absence from the Washington cocktail circuit, the press has often portrayed Justice Thomas as a severe, aloof, and silent figure, smoldering away in the quiet loneliness of the Court. No portrait could be more wrong. Justice Thomas is one of the most open and personable of Justices, intimate in sharing his feelings, easily moved to laughter. And he’s among the most frequently visited members of the Court—a steady stream of school groups and others roll through his Chambers, where they get strong doses of wisdom, humor, and observations on life and the law. And they get to hear for themselves his thunderous belly laugh. He is on a familiar, first-name basis with everyone who works at the Court—from his fellow Justices, to the staff in the Clerk’s Office and cafeteria, to the officers of the Supreme Court Police, to the janitors and carpenters who toil in the basement. And those of us lucky enough to serve as his law clerks have always been welcomed as part of his family. My mother was 75-years-old when she met the Justice, just a year after his confirmation. A lifelong Democrat, she had to leave school during the Depression to help support the family, and after my father died when I was 11-months old, she raised me as a single mom, working in a bakery at night and ironing clothes all day for 75 cents an hour. The moment she laid eyes on the Justice, she hugged him tightly and proclaimed her love for him and her heartfelt pain and respect for what he had endured. He spent nearly two hours huddled with her in his office. Afterward, the Justice frequently told us he wanted “to write opinions that Steve’s mother Cora would understand.” And he’s always stayed true to that course. His judicial opinions are simple, consistent, logical, faithful to the words of statutes, based on first principles and unwavering constitutional norms, and never over-intellectualized. Justice Thomas’s opinions will endure, like a guiding star. They will have a positive impact on the work of the Court and the life of the nation for generations to come. Whether or not they agree with his jurisprudence, all Americans are blessed—in equal measure—that a man like Justice Thomas occupies a seat on the Supreme Court. Steven G. Bradbury is an attorney in Washington, D.C., and was a law clerk to Justice Thomas during the Supreme Court’s October 1992 term. He also served as head of the Office of Legal Counsel in the U.S. Department of Justice from 2005 to 2009.